1. History of Air Pollution Control in Japan (Michio Mashimoto). Introduction. The prewar period. Local initiatives in the postwar period. The role of the central bureaucracy in regional industrial development and the smoke and soot regulation law of 1962. The 1967 basic law, the 1968 air pollution control law, and the AAQS for SO2. 1970-74: The pace of change quickens. The pollution trials. Pollution management and total mass emission regulation. Automobile exhaust control, 1965-83. Truck and bus exhaust control. AAQS for NO2 and NOx control plan. Air pollution control and energy. Specific air pollutants. Evolution of air quality management. International perspectives in Japanese pollution control. How Japan conquered air pollution: a historical summary. Conclusion. References. 2. Health Effects of Air Pollution (Hitoshi Kasuga). Basis of epidemiological study. Air pollution and its health effects in Japan for the two postwar decades. Tokyo-Yokohama asthma. Yokkaichi asthma. Relationship between asthma and air pollution. Compound air pollution. Health effect of NO2. Other types of air pollution. References. 3. Emission Control Technology (Hajime Nishimura and Masayoshi Sadakata). Automobile emission control. NOx emission control from stationary sources. SOx emission control from stationary sources. References. 4. Monitoring and Simulation (Yukio Yanagisawa). Continuous monitoring. Passive monitoring. Atmospheric models. Estimation of emission. Example of computer simulation. References. 5. System for Regulation (Saburo Kato). Basic framework for air pollution control. Regulation of SOx. Regulation of NOx. Regulations of particulates, hydrocarbons, and other toxic substances. Unique efforts by local governments and industry. General references. 6. The Pollution-Related Health Damage Compensation Law (Michio Hashimoto). Introduction. The four pollution cases. Litigation. Legislation. The pollution-related health damage compensation law. Performance and problems. Conclusion. References. Subject Index. Many parts of the world suffer from urban air pollution and, despite the vast amount of knowledge about its causes, most countries are slow to implement counter-measures. An outstanding exception is Tokyo which, once blanketed in a mantle of smog, now enjoys clean'' air in spite of highly concentrated activity and congested traffic. 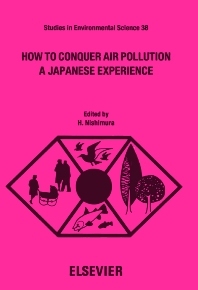 Based on the successful Japanese experience, this book describes all aspects of the measures necessary to combat air pollution. It begins with a well-documented history of the fight against air pollution and describes the processes and mechanisms of reaching a social consensus on pollution control. The essential steps in the process are the establishment of ambient air quality standards, the introduction of the total allowable mass of emission, and the legal control of each emission based on diffusion equations. The scientific background to this approach is fully explained, from epidemiology to computer simulations of air quality. An up-to-date account of emission control technology is also given, and the controversial issue of health damage compensation is examined, based on actual experience. An important feature of the book is that it is written by authors who were actually in the forefront of the battle against air pollution in Japan. Two of them worked successively as Director General of the Bureau of Air Quality of the central government, and a third helped local governments to force the central government to implement the most stringent auto-emission controls in the world. The book is intended not only for scientists, engineers and administrative planners dealing with pollution control, but also for anyone concerned about the serious global problem of urban air pollution.